very easy to install and storage, application for the indoor, School, Office and Club. 1.The 25 mm middle density fiberboard ensures that the deformation caused by the body squeezing the panel or the hand pressing panel is avoided when the ball is hit and killed.The high strength steel support makes the table more firm and stable, and the bearing capacity is more powerful. 2.Push and pull freely, mobile more convenient, folding space occupation is small so that entertainment is feasible everywhere. 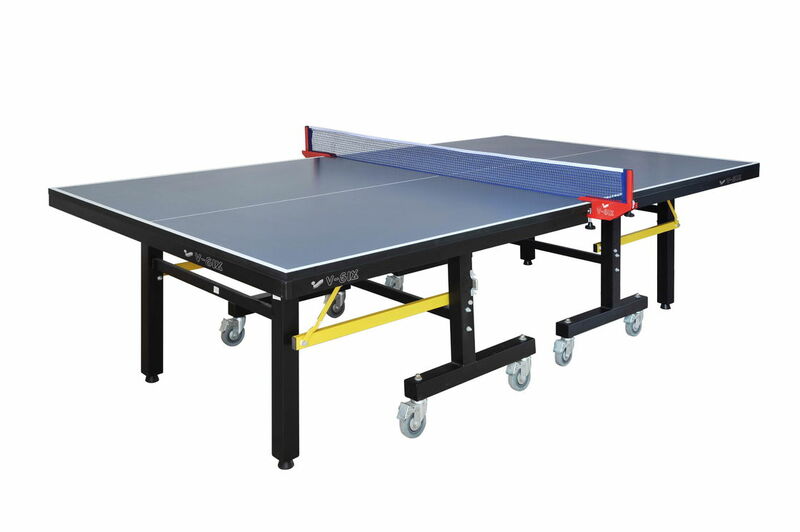 (1)The V-six table tennis table is used in the production of UV or PV layer, which is environmentally friendly, hard film, good elasticity, fine workmanship. (2)Wear resistance. There is no need to worry about the long-term wear of panel from playing table tennis. (3).Exquisite workmanship. resistance to sweat erosion, easy erasure, as long as gently wipe out with damp cloth. and more important is non-toxic, formaldehyde and other harmful chemicals. (4)Sturdy steel legs with a premium matte black powder coat finish create a solid, sturdy base structure. Rubber leg levelers protect your floors from scratches.